So sorry I haven't had any bloggy time lately. Extremely busy!! Getting so many orders, can hardly keep up. Easter, crowns and weddings keeping me on my toes for sure. Hope you are enjoying Spring so far. We haven't had much Springtime weather yet. Still kind of dreary and cool. Glad Easter is late this year. I haven't even had the chance to get my backyard ready for Easter brunch yet. As soon as the sun warms it up and dries it out I will be ready to clean up winter and plant some new flowers. Heading out to the Ventura Flea Market tomorrow. Must get back to work now, I have 21 crowns to make. I was busy making Easter Baskets for the Agoura Antique Mart. I can't believe that it's now Daylight Savings and Spring will be arriving this coming weekend, not to mention that St Patrick's Day is Thursday. Where does the time go? I made the twig Easter baskets kind of like my twig crowns. They are a lot of work, but worth the effort. The small baskets are a lot of fun to make and are great to fill up with candy eggs, or one big dyed egg, or jelly beans. They make great place cards or favors for your Easter table. Well I had better get back to work. Enjoy your week. Happy St Pat's Day! I have been busy making things for Spring and Easter. I think the weather is starting to feel like Spring around here. I have been really busy lately (don't I always say that)? I'm sure you are all very busy too. I'm making things for several shops, custom orders and I'm doing a wedding. I want to do some projects around my house as well. Other than that, I have nothing to do. I hope you all have a great week!! My daughter's friend Janice has a great website for moms. It's called mommawords. 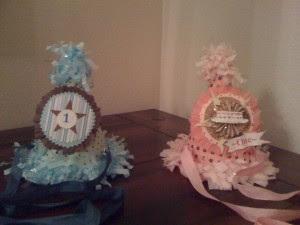 Go to www.mommawords.com for a party hat give away. Party hats made by me. I'm still here working on crowns, vintage jars, wedding stuff, banners, etc. I'm checking your blogs when I can. The new cottage of the month is up on Jennifer's site The Old Painted Cottage so check that out if you have time. The house is in Virginia and it's beautiful. Anyway, I thought you might like to see Janice's site and try to win a couple of my party hats. Enjoy!! I am posting a button to her site on my sidebar. Hope it works if not just google her site.